As is her usual method, Nnedi Okorafor mixes fantasy and science fiction here, in a story of mathematical mysticism, strong cultural ties, and intercultural communication. The main character Binti is a Himba, a (genuine) people of the Namib desert who (in this story) have developed mathematics to a high art. They don’t have enough water to spare for washing so they keep clean by rubbing their skin with otjize, red clay mixed with flower oil. 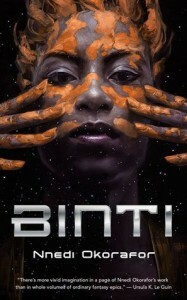 Other humans (especially their neighbors the Kush) look down on the Himba, and when Binti is chosen to be the first Himba to attend Oomza University on another planet — because of her mathematical abilities, she is a “master harmonizer”–, her family is dismayed and she feels profoundly dislocated. However it turns out to be a good thing that she decides not to give up her otjize, and her calling as master harmonizer turns out to be crucial when she is a bystander caught up in a war that has a large element of cultural misunderstanding at its basis. Mathematics is used symbolically in this story as representing harmony and clarity. Binti can call on both to think her way out of potential conflicts, and be understanding enough to make a friend out of an initially incomprehensible alien. Her position as cultural outsider makes her a good mediator too. It is a simple plot, and there are a few too many deus ex machina elements in it. Still, it is well told, with many reflections on belonging and outsiderhood in contexts of cultural conflict. Rating: recommended.